BEACON FALLS — The Naugatuck River didn’t freeze this winter, but construction on the Beacon Falls streetscape project did. Warm weather returning, though, means work is set to resume soon on the downtown greenway. The project was originally slated to be finished in December but a number of issues, including guardrail excavation, draining issues, and contamination removal, ran construction past deadline and forced its winter hibernation. First Selectman Gerry Smith said that work should begin again in early April with a target completion date of May 15, but it could stretch as long as the end of May. 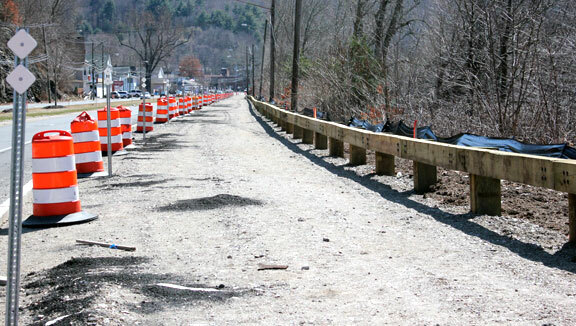 The sidewalk is part of the Naugatuck River greenway project, which will stretch about 44 miles from Torrington to Derby when all communities finish their portions. In Beacon Falls, the southbound side of Main Street from the Route 8 North on-ramp to the Route 42 intersection has been reduced to one lane. The finished product will be a little less than 15 feet of space from the Depot Street bridge to Route 42. Selectman Dave D’Amico said there will be a four-foot strip of grass closest to the road with about a nine-foot paved asphalt walkway nearest to the river. A wooden guardrail lines the riverbank, and LED light poles will be erected down the entire stretch. The entire project was originally set to cost a little more than $1 million, with the town being responsible for just more than $205,000. When construction began last July, the former Board of Selectmen had yet to account for about $15,000 of the cost. Smith said an extra $30,000 in unexpected costs for drainage work and other issues has been piled on top of the original $15,000 shortfall, and to pave the roadway would cost another $30,000. He said none of that $75,000 has yet been secured. One of the intentions of the project is to help spur economic development in the downtown area. But some local business owners are either unsure of its potential effects or upset at its execution. Bradley acknowledged that the sidewalk may bring an aesthetic value to downtown and be a nice location for people to watch the upcoming Sinko de Mayo Yaks and Quacks Race in May. But Rodney Vardon, owner of Beacon Motor Cars at the corner of North Main and Depot streets, is upset at the construction’s impact on his business. The right-hand turn lane onto Depot Street has eliminated curbside parking for his shop. D’Amico said the Board of Selectmen understands the logistical and financial problems created by the sidewalk and is trying to manage them as effectively as possible. “We’re just trying to work with the consulting engineers, contractor, and the state to try to make this project come in hopefully with not much more of a cost, but make it correct,” D’Amico said. Smith agreed that the construction has created problems with parking and traffic downtown and that the issue is on his radar. Parking was addressed in the original Downtown Renovation plan defined in 2002 by EDC. That plan removed the median and centered Main Street, which added parking along the streetscape and for downtown businesses. This is NOT the plan that was executed and there have been no discussions to-date to follow the original plan. It should also be noted that the 44 mile Naugatuck River Greenway has never been finalized. Current plans show “options” for traveling through Beacon Falls, one on each side of the river coming from Naugatuck. At best, our streetscape may be just a spur off the main greenway once the plan is commissioned.